Our new bed has arrived. It wasn't exactly easily gotten, but we got it and here's how it went down. In my previous post I tempted you with the seller's picture of our soon-to-be new bed. After exchanging about a gabillion emails with the seller (who was so nice, by the way! ), we had a plan to drive to a little town just south of Winston-Salem on Friday afternoon. Seth and I left work around 2pm and had hoped to get on the road by 3pm, but alas, and to my GREAT SHOCK (cue the sarcasm) we actually didn't get to leave until 4pm. We were slightly concerned that our king-sized bed wouldn't fit into the back of this truck since it had an extended cab, but what could we do? Pretty much nothing but hit the road and figure things out when we got to the seller's house. The drive was quick and we got there around 5:30. We met the seller's hubby and he was such a kind, southern gentleman who helped us get the bed into the truck with great care. It was apparent how much he loved this piece of furniture. After a while, we had the thing locked down with the help of many bungee cords and blankets. 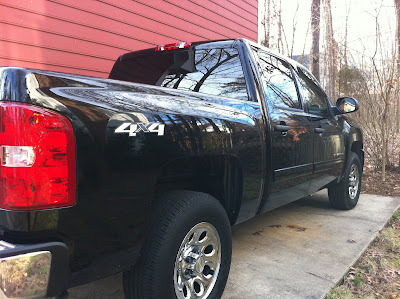 The bed hung out the back tailgate, but its heft would keep it from moving or sliding out. When we got home, the BIL came over to help Seth lug the bed up the stairs. I wish I had taken pictures of this event. It ALMOST didn't fit up the stairs. In fact, the top molding of the bed has white paint from where it scraped the ceiling of the stairwell. OOPS. Oh well, if we ever sell our house, the bed is staying with it! But we got it in and assembled before we went to bed (er, to "couch" that night). Isn't it fab? It's HUGE compared to our old queen bed (which now resides in the downstairs guest room). Our old bed had a foot board, but it just covered up the box springs, so this one really has a presence in the room. Our room is a good size and has high ceilings so it's sort of nice to have a bed that really fills up the space. It makes it so much cozier. 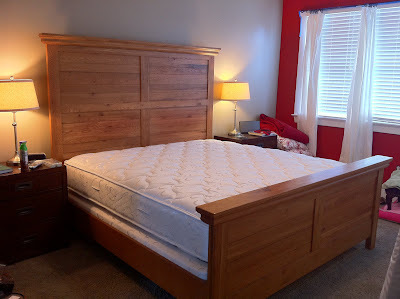 As you can see, the new bed has that honey stain typical of many oak pieces. The bedside tables and 11-drawer dresser (not pictured) were bought as a set with our old queen bed and they are dark stained mahogany. It's possible one day we'll try to have the bed stained darker, but for now, I don't mind the difference. Also mentioned in my previous post was the new Pottery Barn bedding I got with a Christmas gift card. Here it is on the bed. Vanna Westie is glaring at the camera because like me, when she saw the bedding actually ON the bed in all of its king-sizedness, she was like "EH" and gave a little shrug of the shoulder. I'm not impressed. The picture a little washed out, but still, it's not quite as lovely as it shows online and in the catalog. SO, it's going back and I'm going to have a custom duvet and shams made! I just can't find the right bedding so I'm going custom on your a$$! Stay tuned for fabric selections and final results. I'm going for a red buffalo check because I saw one several years ago and it still makes my heart go pitter-pat! So that's the bed situation. 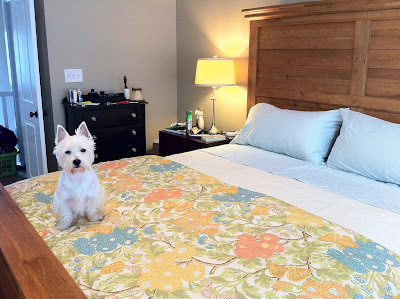 We're trying to break in sheets and get used to our taller bed (well, really the Westie is making the greatest adjustment), and our larger sprawl real estate, but we're loving it. Our house is an utter disaster since we moved 4 beds this weekend. It's been uprooted from one end to the other. Whew. I hope to put a lot of the pieces back together this week(end). It's gorgeous Kelley! The seller's picture didn't do it justice at all!